Many of today’s medical texts tell us the coccyx fuses into one rigid segment by adulthood in most people. However, several well-designed studies have shown that a normal coccyx should have two or three movable parts that gently curve forward and slightly flex as we sit. Two medical papers (Postacchini and Massobrio1 and Kim and Suk2) found that test subjects with fused coccyxes that didn’t flex upon sitting were more likely to experience tailbone pain than those with a normal coccyx. Postacchini and Massobrio performed radiographic studies of 171 coccyxes, and found less than 10 percent were fused into one piece…most had two or three, and a few had four segments. The primary conditions they found to be associated with coccyx pain were: coccyx angled sharply forward; coccyx side-bending more to one side than the other; and coccyx completely rigid (all segments fused together and fused to the sacrum). Although none of the abnormalities listed above always cause pain, clients seem more likely to experience coccyx problems when one or more of these conditions exist. Over the years, I have noticed clients with particularly long coccyxes also seem more likely to report local tenderness and pain. Although not reported in the literature, it seems obvious that a long coccyx would be more likely to suffer damage than a shorter one. Why some hurt and others don’t is unclear. In the case of a misaligned coccyx, it might be that the pain is caused by the coccyx pulling on muscles, ligaments or overstretching the filamen terminale (end of the dural tube). Connective tissues called the filum durae spinalis enclose the end of the spinal cord and attach it to the deep dorsal sacrococcygeal ligament. A major source of hip and back pain occurs as fibrotic sacrococcygeal ligaments anteriorly flex (hook) the coccyx and compress/overstretch the sensitive filum terminale (Fig.1). In the case of a rigid coccyx, it might be that the tissues under the inferior segments might create a pad of irritated tissue (like a bunion) that can rub the dura raw. But the most common pain-generator helped by manual therapists is neuroreceptor pain from a misaligned sacrococcygeal joint. When sitting, the coccyx shifts forward and acts as a shock absorber. However, falling on the tailbone or events such as childbirth can lead to coccygeal pain, known as coccydynia. In most cases, the pain is caused by an unstable coccyx, resulting in chronic inflammation of the sacrococcygeal joint. Coccydynia also can be attributed to a malformed or dislocated coccyx and the growth of bony spurs on the coccyx. Resulting pain often is resolved by performing specific soft tissue techniques to release the levator ani muscle, anococcygeal, sacrotuberal and sacrospinal ligaments, as well as the gluteus maximus muscles. Another common etiology is childbirth. 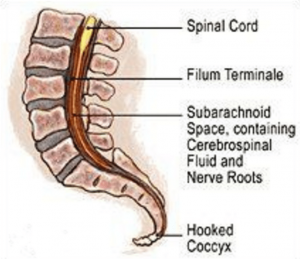 The coccyx is considered by some to be in the way during childbirth. At the end of the third trimester, certain hormonal changes enable the synchondrosis between the sacrum and the coccyx to soften and become more mobile. This increased mobility of three to five coccygeal segments allows for more flexion and extension, which might permanently change the resting tension of the surrounding ligaments and muscles. Unlike fractures, which can remodel, injuries to the sacrococcygeal junction often become inflamed as the joint is repeatedly forced out of its normal position. Physical examination should include direct palpation of the coccyx for tenderness. In true coccydynia, the coccygeal region usually is markedly tender. If the client reports coccygeal pain but is not tender upon palpation, the therapist should refer out for an orthopedic workup to rule out lumbar disk disease. Coccyx pain often is caused by falling backwards or by childbirth, although in many cases, the exact etiology is unknown. There are various treatment modalities available, and the great majority of sufferers can be helped. Due to the vertebra’s direct attachment to the dural membrane through the filum terminale, coccyx work can cause a client to become very emotional. Prior to treating coccyx dysfunction, always ask the client’s permission to perform this technique due to possible physical and emotional hypersensitivity in the area. Before performing any type of coccyx work, take time to clearly explain your therapeutic intent and the desired outcome. All coccyx alignment techniques should be performed through underwear or draping. Postacchini F, Massobrio M, Idiopathic coccygodynia. Analysis of fifty-one operative cases and a radiographic study of the normal coccyx. The Journal of Bone and Joint Surgery. 1983 65(8): 1116-1124. Kim NH; Suk KS: Clinical and radiological differences between traumatic and idiopathic coccygodynia. Yonsei Med J, 1999 Jun, 40:3, 215-20.